not always about monkeys | i can't really tell you what this blog is about, but I can tell you what it's not about. monkeys. at least not all the time. Where Can You Find Buffy the Vampire Slayer Stars Now? Buffy the Vampire Slayer was an uber popular TV series on the WB channel, inspired by the Buffy the Vampire Slayer movie. It ran for 6 wonderful – Buffy-filled years, and even inspired a spin-off called Angel, about Buffy’s boyfriend (which was a great show too). So what exactly are Buffy & the gang up to now? We decided to find out! After being Buffy, Sarah Michelle Gellar, appeared in several popular movies that many will recognize instantly – I Know What You Did Last Summer, Scream 2 and then Cruel Intentions. She even did a cartoon movie, Scoobie-Doo 2. Next she did a super spooky movie called The Grudge. She has continued acting and has appeared in both film and television shows. Most recently, in 2015, she has co-founded a business called Foostirs, which sells baking kits for kids. After being the super psychic and powerful Willow, Alyson Hannigan went on to be part of the very happy couple on comedy show, How I Met Your Mother, playing Lily Aldrin. She’s also well known for her quirky character part in the American Pie films. He played a funny guy on Buffy and his next role was as a funny, sweet guy Kevin Lynch on Criminal Minds, who became Garcia’s boyfriend. Brendon since 2014 has also been writing the Buffy Season 10 comic books. As Buffy’s Mom, Kristine Sutherland appeared regularly on the show and with lots of unique, magical-type of characters, she was a bit of normality. She is also known for her role of Mrs. Thompson in Honey, I Shrunk the Kids. James – known as the slightly snarky but totally cool “Spike” bad boy vampire who finally turned good, was on Buffy the Vampire Slayer for a long time. He was one of the original Buffy actors to go on to be on the Angel spin-off show, from 1997 to 2004. He’s done some fun sci-fi roles, including appearing on Smallville and Syfy’s Caprica. He also has appeared on CBS’s Hawaii Five-O most recently. Amber played Willow’s romantic partner on the Buffy show in later seasons. After this show, she then directed, produced and starred in her own films, Chance and then also Lovers, Liars and Lunatics, both in the early 2000s. With fellow former Buffy cast member Adam Busch, she co-directed the film Drones. Just about every Buffy TV show fan knows that the Buffy & Angel romance is very much like Romeo & Juliet: a little bit tragic and also very much meant-to-be. David went on to have his own spin-off show Angel after the Buffy TV show, and then after Angel he now appears as a leading actor in the crime comedy-drama Bones, which has been on the air since 2005. Well, its been fun catching up with Buffy & the gang! Who knows, perhaps they will have a reunion show! What do you think….would you watch a Buffy reunion show? I had to wake up early today because my mom was going to have a heart procedure. Sounds scary, I know. It’s called a cardio version, and it’s when they knock you out for a sec and then shock you with paddles. She’d been in a-fib for weeks and weeks and her cardiologist decided this would be a good option. We’ve both been pretty freaked out about it (though I’ve tried not to show it). When I woke up I checked email, like normal, and then I checked Facebook. I found that one of my friends died. He and I weren’t super close, though we talked on the phone sometimes. 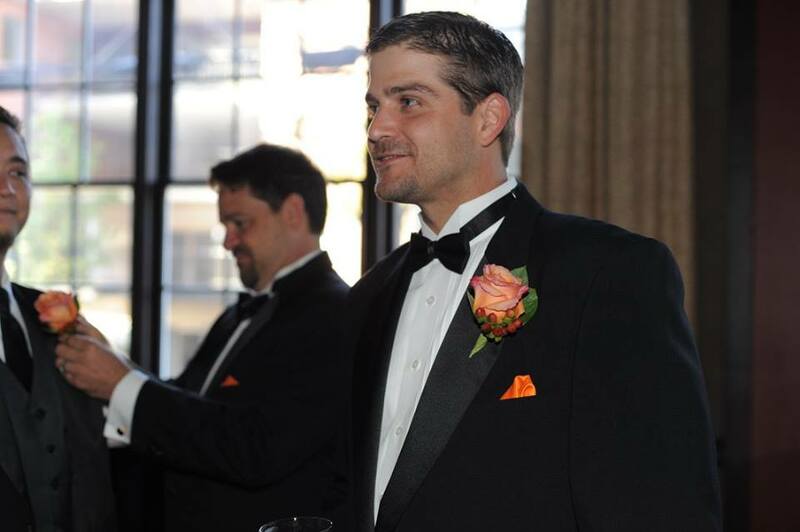 The first time I met him we hit it off like gangbusters. He was like the male version of the wackiest version of me. He’d had some hard times, but the last time I talked to him he was making good steps toward a decent, happy life. Oh yeah, and he looked kind of like Omar Sharif. This one hit me pretty hard. Not gonna lie. A lot of people loved him, thought he was awesome, were friends with him, and more. He was the kind of guy who made you feel like you had this special bond with him. I thought he was neat, and I thought he was getting started. And instead he ended. Rest in peace, Benny. The world is darker without you in it. I finished crying and got ready, and Mom swung by to get me and we were off to the hospital. We checked in with Outpatient and made it over to the Cardiac Cath section. I got to sit with Mom for a little while, but then they came and got her and told me to go upstairs to the waiting room. I have been feeling pretty bad lately – this medication I’ve been taking has made me sick and now that I’m not taking it I’m still sick. I’ll find out more about that tomorrow. Stress and worry make it worse. So I had a miserable couple of hours. They finally called and said Mom was done. I asked if she was OK, and the guy said that he was just told to call me so I RAN down the weird downward moving strip thing, through the lobby, down the hall and into the Cardiac Cath lab. When I got there, they said she was OK. Yes! 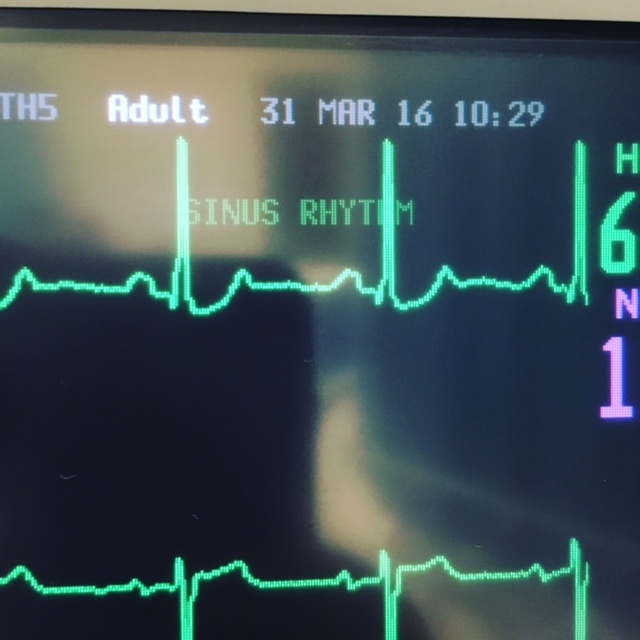 Sinus rhythm. NO MORE A FIB! We’ve had a really nice day. I had to do some work but Mom is feeling OK, the sedation has mostly worn off, and her heart is feeling fine. Thank goodness. It HAS been wise to binge watch Ally McBeal and just enjoy each other’s company. Hopefully tomorrow will be a brand new kind of day for her. One where she doesn’t have a floppy heart and she feels super good. I’m going to work on feeling good too. It can be hard, though, with everything going on in the world, especially when it’s so sad. On March 31, Virginia State Trooper Chad Dermyer was shot and killed at a training exercise at the Greyhound bus station here in Richmond. It was a senseless killing, and it’s hard to accept that things like that happen in a world where we’re trying to keep each other alive. It made the national news, of course, but some other truly awful things have been happening right here in Richmond. So I urge all of you, be nice. Be kind. Be compassionate. Soapbox? Not really. Just common sense. Welp. Had a birthday. It’s my 39th. I contemplated denying turning 39 and just telling people I was 38 again, since people still seem to say “oh my gosh I thought you were still in college,” regardless of the fact that I have definite wrinkles. My favorite pharmacist advised me to own my age, going on the logic that as long as I am honest about my chronological age and tell people how old I am (and as long as I look a little younger than I am) that I will still get ego-boosting affirmations from people amazed at the fact that I’m 39 (and then 40, and then 41). I had a nice birthday weekend. My super fantastic mom knocked herself out to make it special and got me flattering but comfortable clothes so that I don’t feel bad that I’ve put on 10-15 pounds since the wedding. 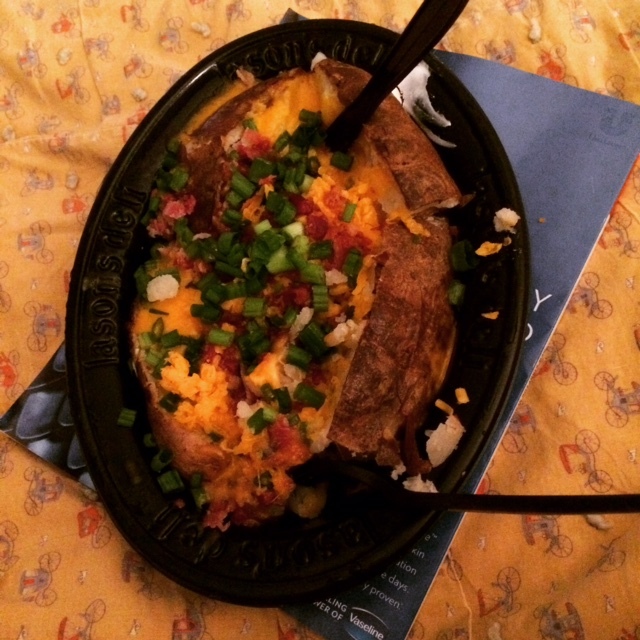 It’s mainly because of the fact that I eat a giant baked potato from Jason’s Deli at least once a week. They’re as big as my head, and delicious. Considering I had to go back through my photos to find this picture (March, 2015), and I’ve had at least one of these a week, I have a bit of a potato baby. 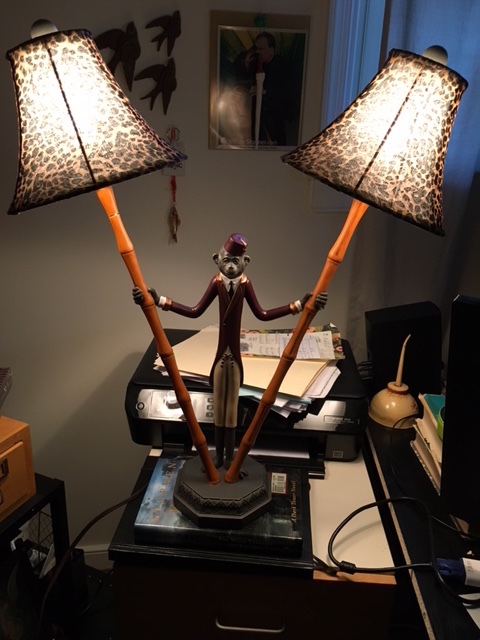 Boyfriend (aka Husband) got me a fantastic monkey lamp, as well. I’m lucky. Very, very lucky. On the work front, still trucking along. Freelancing, working at W.E. Buy, and tutoring. Overall, I’m pretty happy to be on the planet another year. And maybe I’ll go to every two weeks on the potatoes. I would like to stay on the planet for a long time.